GIVEAWAYS! - Mom Made That! Win a PERSONALIZED OVERNIGHT DUFFEL BAG by Suzi Homemaker! Going somewhere? 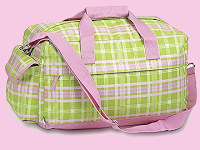 Be sure to get there in style with this hip overnight duffel bag made by Room It Up and personalized bySuzi Homemaker. You will love the ample storage this overnight bag affords and, with two interior mesh pockets, you will be able to keep all of your essentials organized. A hidden front outside zip pocket and a convenient Velcro side pocket are perfect for easy access to all of your smaller items. Adjustable shoulder strap with lobster claw closure included! Measures 17″ x 10″ x 11″. Your choice of color and monogram style! To enter this giveaway, simply visit Suzi Homemaker’s website at www.suzihomemaker.net, and leave a comment here about a product that caught your eye! Giveaway ends 6:00 p.m. CST on January 11th, 2009. One lucky winner will be randomly selected and contacted on January 12th, 2009. USA residents only please. Good luck!